Social media has had a massive impact on hiring markets worldwide. The role of LinkedIn – and the ability it’s given recruiters to find and approach their ideal candidates – has received the lion’s share of media coverage. However, it’s the relationship between candidates and recruiters that has arguably been transformed more than anything else. Let’s reflect back in time for just a moment. You don’t need to have that long a memory to be able to picture a time when candidates were treated almost with disdain. Only a decade ago, most openings were still being publicly advertised and employers would ask candidates to submit an application if interested. This could be described as the “Black Hole” era. Candidates had little scope to talk to recruiters or other people in the business prior to submitting an application. The decision to apply was taken on the strength of the advert copy itself and what little else the candidate knew about the company and its reputation. Communication was not two way, only upon reaching the interview stage would a candidate have the prospect of talking to anyone within the business. For most, applying to jobs meant their applications disappearing into a Black Hole and often hearing nothing further about the opportunity. Contrast that scenario with the situation today. We’re in an era when employers are powerless to prevent candidates from interacting with staff members before, during or after any interview process. The impression that candidates have formed of a company is also less within the control of companies today than it was previously. What former staff are saying about you on Glassdoor, how you are being talked about in social media groups, tweet content , anecdotes on Facebook, LinkedIn interactions… all these and more are shaping candidates’ impressions of you as an employer and impacting the likelihood of talent within your market wanting to apply for a position with your business. Ultimately it’s also influencing whether they’ll choose to accept any offer they may subsequently be made . The key to harnessing social media to boost your candidate experience is to start thinking about your candidates as consumers. What will make candidates more likely to pay attention to an opening with your company? What will make them more likely to apply for that opening? What will maximise the chances of them progressing all the way through your interview process without dropping out? Then ultimately, what will make them accept your job offer and go on to stay with your business for a great many years thereafter? What’s a candidate’s first exposure to your business? What reach does your business and your recruitment team have to candidates on social media? Do most of the people your business would want to hire regularly and consistently see your brand in their social media feeds? Are they aware of you, are the impressions they have of your business favourable? With the right investment, these are things that your company can influence and build upon. Is your business personable? How many people within your target candidate market have your business interacted with on social media over the last years? Do you proactively go out and seek to engage with people in your market…and do you welcome candidate questions and enquiries and respond to these in a prompt and friendly manner? Shrewd recruitment teams know that candidates have long loathed the poor treatment they have received when they’ve tried to engage with recruiters in previous job searches. By being personable and interacting with candidates en masse, companies can transform candidates’ impressions of them, allowing the business to leap-frog competitors to become one of the companies that candidates would most aspire to join. Do you tackle candidates objections? At the point of seeing a job advertisement, or being approached about a position directly, many candidates will have questions and concerns that need to be addressed in order to maximise application rates. Through training and culture change, businesses can encourage all staff to be responsive to any such enquiries – and recruitment teams in particular can stand out from the crowd by making themselves available to respond to such enquiries. But we have to be conscious of the fact that recruitment teams alone cannot fulfill this role. You cannot control which staff members a candidate may reach out to for input and advice. So you have to ensure that staff across the business have had the right training to handle these situations in a consistent manner. Are you proactive during the interviewing process? You could leave candidates to dwell on your opportunity between rounds of interviews. You could hope that the impressions they formed are strong enough to see them through. But why not be more proactive? Why not have a strategy that anyone going through the interview process will be reached out to on social media by one of your team – so that they have someone to talk to with any questions or concerns they may have during that process. Remember that recruiting is a numbers game, so every opportunity there is to attract more of the strongest candidates, or to keep those strong candidates on track to be hired by your company, will ultimately boost the effectiveness of your overall recruitment strategy. Do you ensure a smooth onboarding process? the role of social media doesn’t just end at the point at which a candidate offer is made. 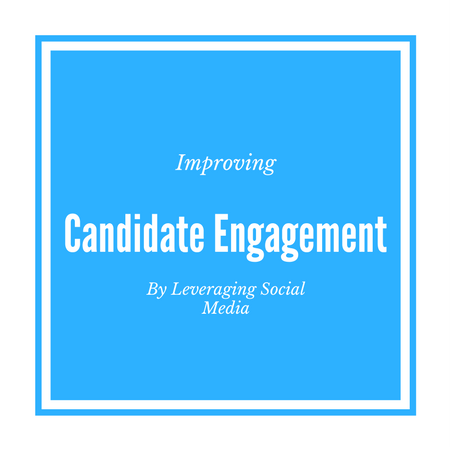 Rather, there is still the potential for social media interactions to influence whether a candidate accepts the offer and then to help ensure that they have a smooth transition to their new employer and instantly feel welcomed and supported in their new role. Try to assign staff members who will interact with your prospective new hire from the moment an offer is made right through until they’ve been working in the role for quite a number of months. The stronger the bonds you can form between the candidate and your company, the more likely they are to accept the position and the more likely they are to have a happy first few months employed within your business. We hope these ideas very much help you to leverage social media within your recruitment team and engage with candidates more effectively. As ever, if you have any recruiting needs we can assist with, do you feel free contact us by clicking here.